If a picture is worth a thousand words, then one look at photos of this palatial movie palace is worth about a million. Often cited as the most impressive movie palace ever built, the Roxy Theatre was called “The Cathedral of the Motion Picture” by its creator and namesake, Samuel ‘Roxy’ Rothafel. (Left: Roxy next to the famous organ. )Roxy was arguably the greatest showmen of his time and he built a theater that has seemingly outlasted his own legend. On March 11, 1927, the Roxy Theatre opened at 761 Seventh Avenue in New York City. 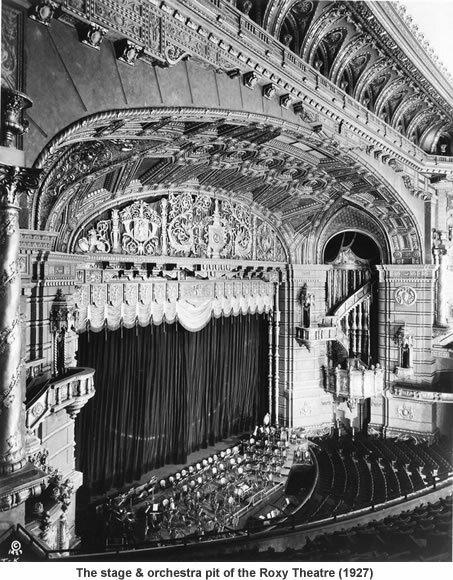 Named after its creator, the film exhibitor Samuel “Roxy” Rothafel, and designed by the Chicago architect, Walter W. Ahlschlager, the Roxy was the largest and arguably the most elaborate movie palace ever built. 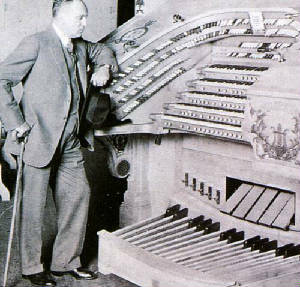 Each performance at the Roxy would include the great theatre organ. It would rise from the orchestra – similar to this present day concert opening. 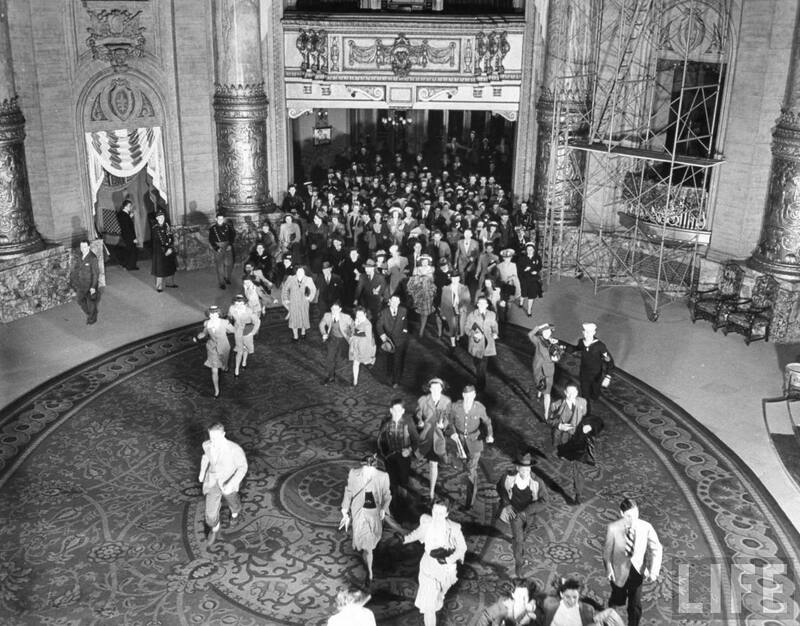 (Left: Patrons entering the lobby of the Roxy in the 1940s) This self–proclaimed “Cathedral of the Motion Picture” had 5,886 seats*, employed a staff of 300 (including 16 projectionists, 110 musicians, and 2 trained nurses), and cost $12 million to build. The theater contained a complete hospital with an operating room, a 550–ton ice–cooling plant, and its own radio broadcasting studio. Sensors in each seat were wired to a centrally located wall chart of the theater’s seating plan. By observing which lights were on or off on this wall chart, the ushers could quickly see which seats were not occupied. 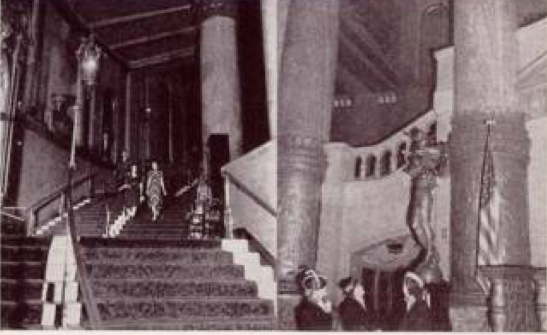 Among many other “firsts”, this was the first movie theater to use a rear–projection system developed by the Trans–Lux Daylight Picture Screen Corporation. 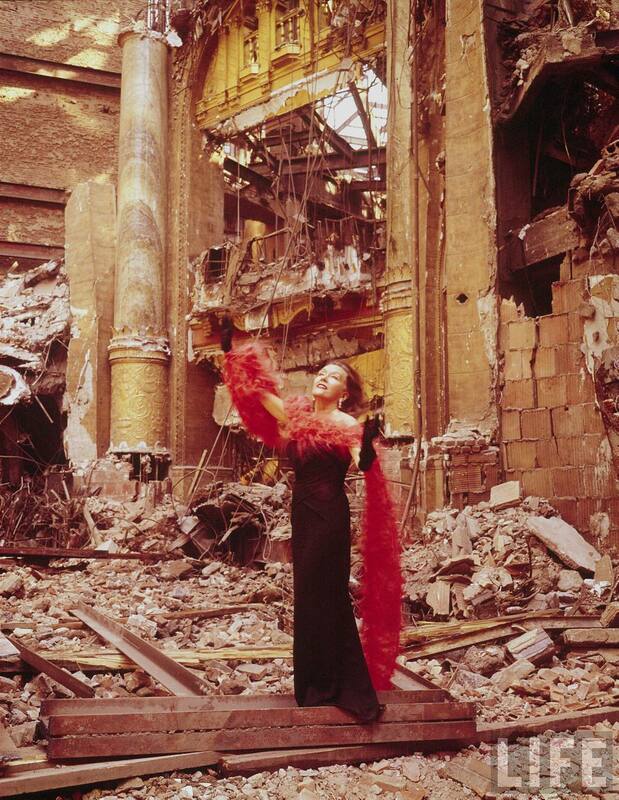 Famous film star Gloria Swanson (Sunset Blvd) was photographed by Life Magazine in the ruins of the Roxy when it was torn down to make room for an office building. Roxy created the Rockettes. 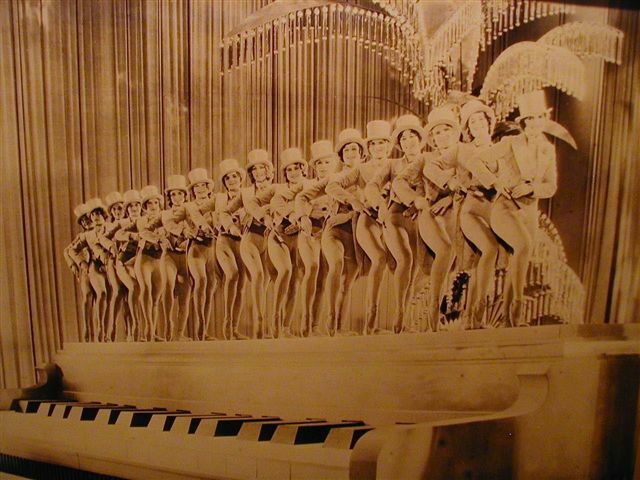 The group was founded in St. Louis, Missouri by Russell Markert in 1925, and originally performed as the “Missouri Rockets.” Markert had been inspired by the John Tiller Girls in the Ziegfeld Follies of 1922, and was convinced that “If I ever got a chance to get a group of American girls who would be taller and have longer legs and could do really complicated tap routines and eye-high kicks… they’d knock your socks off!” The group was brought to New York City by Samuel Roxy Rothafel to perform at his Roxy Theatre and renamed the “Roxyettes.” When Rothafell left the Roxy Theatre to open Radio City Music Hall, the dance troupe followed and later became known as the Rockettes. 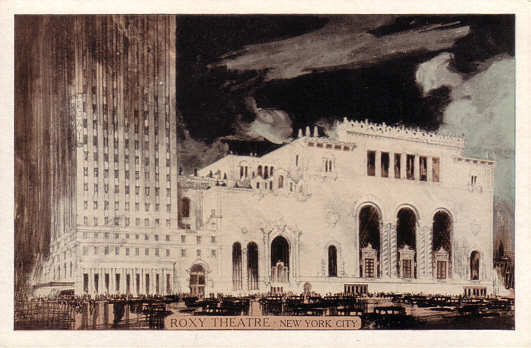 With its nearly 6,000 seats and multi-tiered balconies, the Roxy Theatre was the showplace of New York City and of the nation. 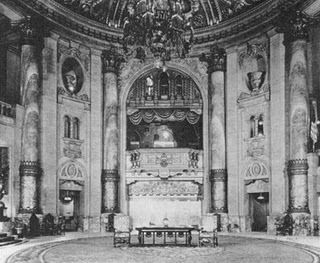 Erected in 1927 and designed by architect W.W. Ahlschlager of Chicago (who also designed New York’s Beacon Theatre), its rather modest entrance at the Taft Hotel disguised one of the most cavernous lobbies ever built and a magnificent auditorium that has lived on in its patrons’ imagination. Whatever adjectives can be used for the Roxy Theatre, they all fail to signify the theatre’s achievement. 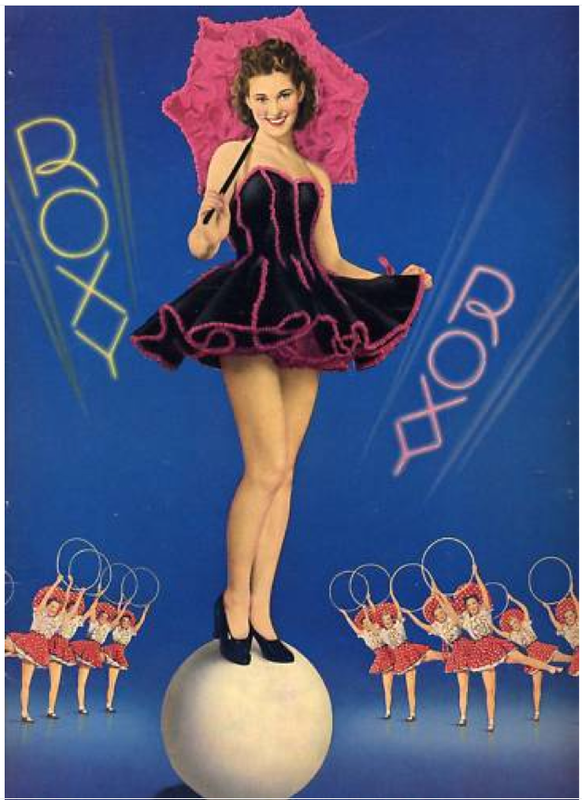 A typical two–hour program at the Roxy, which originally changed every week, would begin with an elaborate live ballet on the Roxy’s large stage followed by a news reel. The news reel, in turn, was followed by a talented chorus that would perform either an original composition, popular songs, or a classical arrangement. 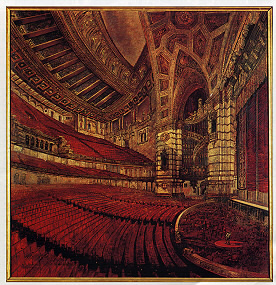 When this ended, three shafts of rose–colored light would illuminate three massive organ consoles as they rose from the orchestra pit. The three organists would entertain the audience, take their bows, and then play a parting tune as their consoles sank slowly below the rail. The 110–piece symphony orchestra, which had been accompanying the live entertaiment, would finish with one or more classical pieces. Then the feature film would be shown, and if it was a silent picture the orchestra would provide appropriate background music. Sadly, the decline in attendance that had begun in the 1950’s spilled over into the early-1960’s and the Roxy Theatre, despite numerous protests, was razed in 1961. In its place sits a non-descript and unremarkable office building. The neighboring Taft Hotel survives to this day (now the Michangelo Hotel) and is the only evidence that this epic structure was ever here. A TGI Friday’s restaurant occupies the theatres’ original entrance. The legacy of the Roxy Theatre is almost as impressive as the theater itself once was. 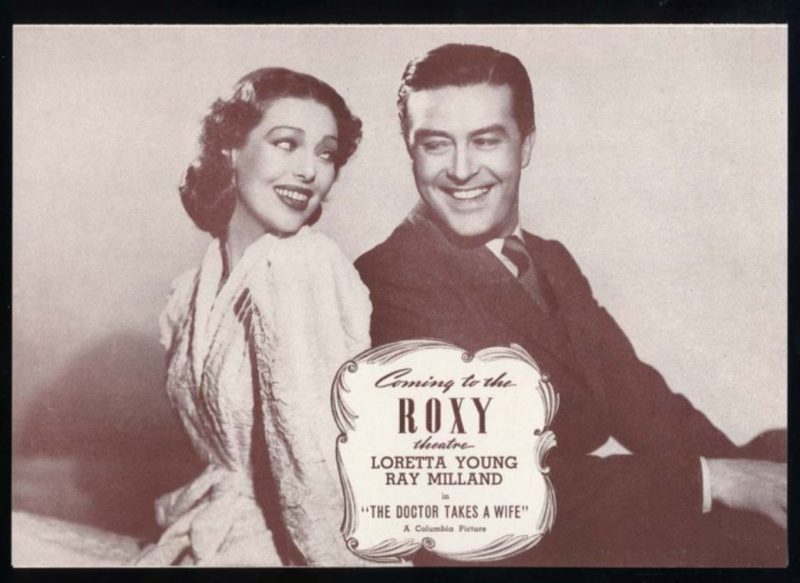 The name ‘Roxy’ has since adorned movie theaters, nightclubs, restaurants and a host of other establishments around the world all attempting to give to their patrons what Roxy always brought to his own: entertainment. The end of the Roxy Theatre signified the beginning of the end for thousands of movie palaces across the country. With its destruction, New York City began to destroy its past for urban renewal and the city, and movie palaces, have never been the same. Next: Lord Ismay, the Princess Olga Koudacheff and Bobby Riggs aboard the United States Lines. The MS Angelina Lauro the sister-ship to the famed terrorist high jacked Achille Lauro.